Seven Days Blogs: Freyne Land: Who are these guys? Distinguished leaders of the Vermont State Senate, that's who. The Baby Boomer generation in power! With one distinguished flash from the Statehouse past in the middle of them - the dude in the leather jacket. Committee rooms and hallways - that's where the action occurs, information's exchanged, deals cut. It's all about communication, eh? On the left is Sen. Jane Kitchell (D-Caledonia). On the right Sen. John Campbell (D-Windsor). [No relation to the soup.] 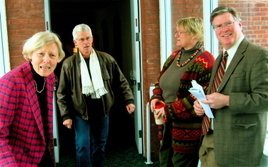 To Campbell's right, Sen. Susan Bartlett (D-Lamoille). And strolling through the middle of them in bomber jacket and white scarf is a flash from the past: former-State Rep. John Freiden, a co-father of Act 60  which leveled the education property-tax playing field statewide. Sen. Bartlett, first elected to the state senate in 1992, is one of the more unheralded, yet powerful political players in Montpeculiar. She's chairs the Senate Appropriations Committee. Sen. Kitchell was elected to the senate in 2004 - the first - no, the second Democrat - ever elected to a Caledonia County state senate seat (Scudder Parker was the first). Born in St. J and raised in Danville, Sen. Jane has long been a Montpelier fixture for quite some time. She's a retired state worker - former secretary of the Agency of Human Services. Sen. Campbell, a relative Montpeculiar newcomer compared to those two, didn't make it to Golden Dome Land until the 21st Century. He's the current Democrat Majority Leader. Was thinking about a gubernatorial bid, but that didn't get far. In fact, the Vermont Democratic Party is still looking for a gubernatorial candidate to challenge Republican Jim Douglas. Jane is NOT the first Dem senator elected to represent Caledonia County. Remember Scudder Parker? He was a Democrat. He was elected as state Senator from Caledonia County long before Jane came on the scene. Let's hope that Vermont Dems can overcome parochial interests and get behind Anthony Pollina, the one chance we have to unseat the Douglas regime. Let's play a little mind game and pretend that Jim Douglas remained as State Treasurer. Let's look back on the last six years and imagine. The Connecticut River Dams were for sale. In a knee jerk reaction Douglas followed the Republick mantra and took Vermont out of the sale. We could have acquired a dependable, 24 hour a day, base load power supply that could have eliminated the need for running our increasingly unstable nuke in Vernon for another 25 years. Today the existing Connecticut River facilities are worth twice what we could have gotten them for just two years ago. Nice leadership Jim! Just imagine that Vermont could say that 50% of it's power came from renewable resources and that the power rates would be stable for the next 50 years. We would ensure the continuance of existing businesses such as the power hungry IBM plant in Essex but we would also be a magnet state for the industries that are at the edge of a new revolution. We have pioneers in the renewable energy business in this state. It's where the jobs and money will be coming from in the future. Wouldn't it be great if we could extend the Vermont cache to them, giving them the same authenticity as our agriculture segment enjoys? We can't if we continue to say, "Do as I say, not as I do." Douglas has done incredible damage to business possibilities in Vermont. He has to go. We can't win if we divide our votes. Let's all get behind Pollina. He'll hopefully face a Democratic legislature and with them will be able to craft a program that puts Vermont workers and small businesses first. "Let's all get behind Pollina." No, thanks. Let's all get past him. Don't you dare try to get near my name "RandomBow". You're missing the concept absolutely completely!